Hostilities in Avdiivka continue day and night, except for a short break between 3 and 4 AM. Militants massively use heavy artillery and “Grad” MRLS. One civilian was wounded and eight houses were damaged. Yesterday in the evening the militant’s fire damaged the last power line which supplied electric energy to the city. “Avdiivka has left without permanent energy, heating and water supply. Local authorities, the army and police take actions to help local civilians. Servicemen of the 72nd separate mechanized brigade and the National Guard deployed ten mobile canteens and tents with heating,” said Col. Oleksandr Motuzyanyk, Ministry of Defense of Ukraine spokesperson on ATO related issues at a press briefing at Ukraine Crisis Media Center. CIMIC officers delivered to Avdiivka more than 2 tones of humanitarian aid, food and household cleaning products. Military psychologists help people. Law enforcement officers patrol the streets day and night. Satellite communication was restored. State Emergency Service deployed a humanitarian staff where local people can take food and receive medical care. “Russia-backed militants reject any ceasefire agreement, they continue attempts to start offensive and take control of new territories. These risky undertakings result in heavy losses, however, the adversary does not cease aggressive actions,” said Col. Motuzyanyk. Intense battle goes on on the right flank of Avdiivka, in the area of “Shakhta Butovka” – Opytne. 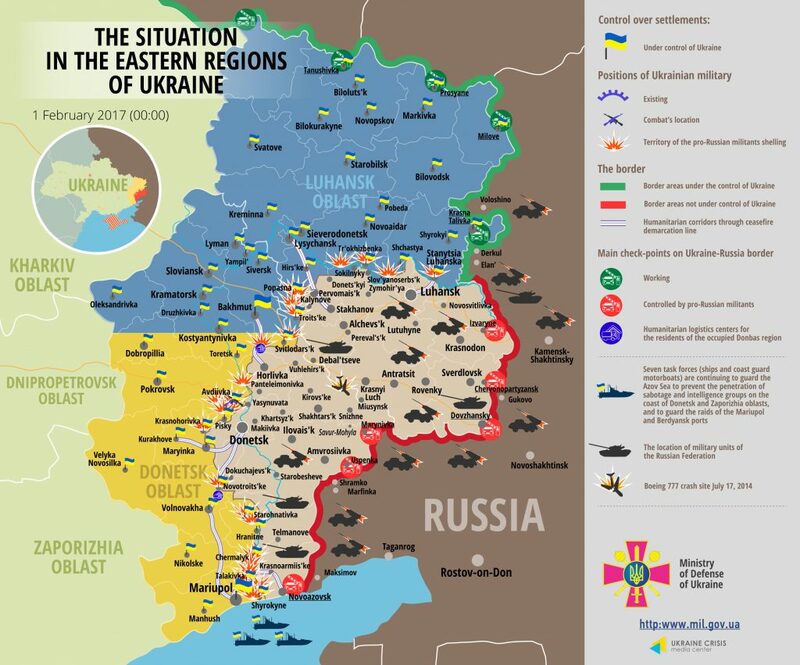 Militants continue intense shelling from tanks and artillery. “All the frontline area on the side of the occupants that stretches between Spartak and the Donetsk airport is packed with heavy weapons. The militants continue firing day and night. They fired from artillery on Tonenke village situated in our rear yesterday evening. The fire was coming from Donetsk, from the distance of at least 10 km,” said MOD spokesperson. Moreover, there were active hostilities on the Svitlodarsk bulge and in Gorlivka area yesterday evening, the militants were using cannons and tanks. The militants suffered heavy losses near Avdiivka, there are 42 dead militants in Donetsk mortuaries. As a result, the so called 11th regiment of Russian occupational forces has problems with low morale. Russian officers had to take command of 11th regiment units, said Col. Motuzyanyk. Russia-backed militants opened fire from mortars and artillery all along the contact line in the Mariupol sector. After midnight, the militants fired from mortars and armored vehicles at Ukrainian positions in Novogrygorivka. In the morning, they fired from mortars in Krasnogorivka, a residential house was damaged by shelling. Areas close to the Azov sea were volatile too. “The militants used mortars at 8 AM and during the day. In the afternoon the enemy used 122-mm artillery. The militants’ sniper opened fire in Chermalyk,” added Col. Motuzyanyk. In total, militants violated the ceasefire 45 times in the Mariupol sector, 17 of them involved the use of heavy weapons. Over 200 mines were launched on Ukrainian positions. One Ukrainian troop was killed in action yesterday. “It happened in Tonenke during militants’ shelling. Moreover, 18 servicemen were wounded, 15 of them in Avdiivka. Three more soldiers were wounded in Luhanske, in Zaitseve and in Talakivka,” said MOD spokesperson. The militants violated the ceasefire 22 times in the Luhansk sector, a half of them involved the use of heavy weapons. They were firing on Ukrainian positions all along the contact line, except from Schastya. Popasna area and Bakhmutska road were the main hotspots, where Russia-backed militants fired on from mortars. They launched more than 170 mines on Ukrainian positions. In Krymske and Novozvanivka the militants fired from 152-mm artillery late at night. The militants’ sniper opened fire in Stanytsia Luhanska after the sunset.